TORTOLA-British Virgin Islands 400m Hurdler Lakeisha "Mimi" Warner and sprinter L'T'Sha "Bella" Fahie, advanced to today's semifinals of their respective events in the XVI IAAF World Jr. Championships in Bydgoszcz, Poland on Wednesday. Carifta Games silver medalist Warner, ran "a safe race" over the barriers finishing in one minute 00.93 seconds to automatically advance and has drawn lane two in the second semifinal today. "After I started, I hit the first hurdle with the wrong leg and from there, I chipped and hurdled with the wrong leg for the whole race," Warner pointed out. "After that, I was trying to come in the top four. It wasn't a hard race and I wasn't really tired at the end. I just tried to make sure I positioned myself so I could advance. I was trying to fix what I messed up because I have to run even faster, if I want to make it to the finals." Warner said she'll adjust her blocks setting so that she can attack the hurdle and lead with her preferred leg. 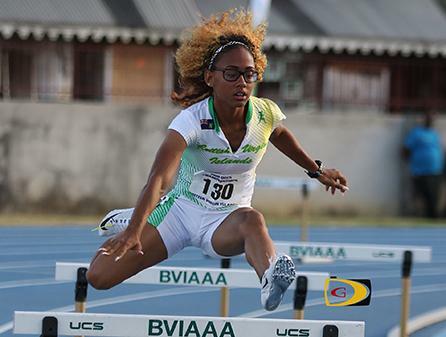 Fahie, a 2015 IAAAF World Youth Championships semifinalist, grabbed one of the six fastest losers spots to reach the 100m semis, after running 11.78 seconds just .01 off the 11.77 personal best she ran in the Invitational segment of the 2nd OECS Championships on July 2. "Warming up, I was very confident in myself, trusted my coach and my training and pictured the race in my head," said Fahie who will run from lane two in the third heat of the semifinals today. "I was nervous going to the call room but as I hugged my teammate Tarika (Moses) all the nerves went out the door. When I got on the line, I told myself that I'd been working long and hard to get kicked out of the first round, so go out and do your thing." Nelda Huggins placed fourth in her 100m heat in 11.87 seconds and the US Virgin Islands' Nia Jack, was seventh in the same heat in 12.33. The BVI's Kyron McMaster will contest the 400m Hurdles today. He will run from lane six in the third of seven heats of the event. Action began on Tuesday, when the USVI's Mia Dorsey finished sixth in the first of five 400m heats. She had a time of 55.21 seconds. The BVI's Tarika "Tinkerbbell" Moses, competing in heat five, placed fifth in her section in 55.04. Neither advanced to the semis.